The Sword of Enethia, a Mithrodin warrior in service to the Great Realm who fought against the Dark One. 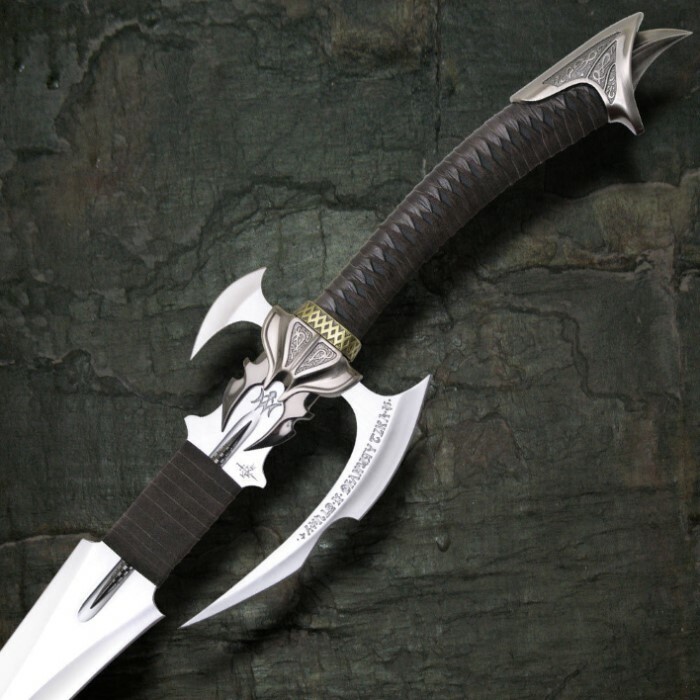 Forged by the dark elf Tethietol, the side blade is engraved with "Avoloch will yield to none but truth", in Anglecal runes. The word Avoloch is from the ancient language of Thant, and it was the name used for the warrior class of the Mithrodin, translated as "soldier of steel". The latest in the Swords of the Ancients collection! The Avoloch features three 420J2 stainless steel blades (false edged), engraved runes, finely detailed cast metal hilt parts with "antique" finish, and a genuine leather wrapped blade and handle grip. 24 1/2" blade. 43 3/4" overall. I just received this sword yesterday to give to my wife for our anniversary and it is impressive as I also own the Mithordin Sword. I cannot say enough great things about Kit Rae swords they are with out a doubt the best purchases I have ever made. This is the last Kit Rae sword I have bought and like the other it's awesome! Kit Rae is just the greatest sword designer there is. ..don't hesitate to buy anyof his products. ..all of them are superb!!!! I gotta say, this is the most gorgeous blade I own! Possibly one of the most gorgeous I've ever seen! The blade inspires both beauty with it's detail and ferocity from replacing the handguard with yet another blade! Well worth the money spent. First let me say that is not the first run limited edition of 1500. This must be a second run because my avaloch i just recieved on 02/06/13 is #2355. I bought this sword thinking it was 1 of 1500 as budk states on their web site. All that aside.. this sword is so awesome i can't believe it. It is the most solid kit rae sword i have. The casting work is perfect and the leather wrap is very nice. I would recomend this sword to anybody who likes quality fantasy art. This is the most amazing sword I have ever seen. Its simply beautiful and I cant take my eyes off of it. The picture does no justice to how amazing and enormous. 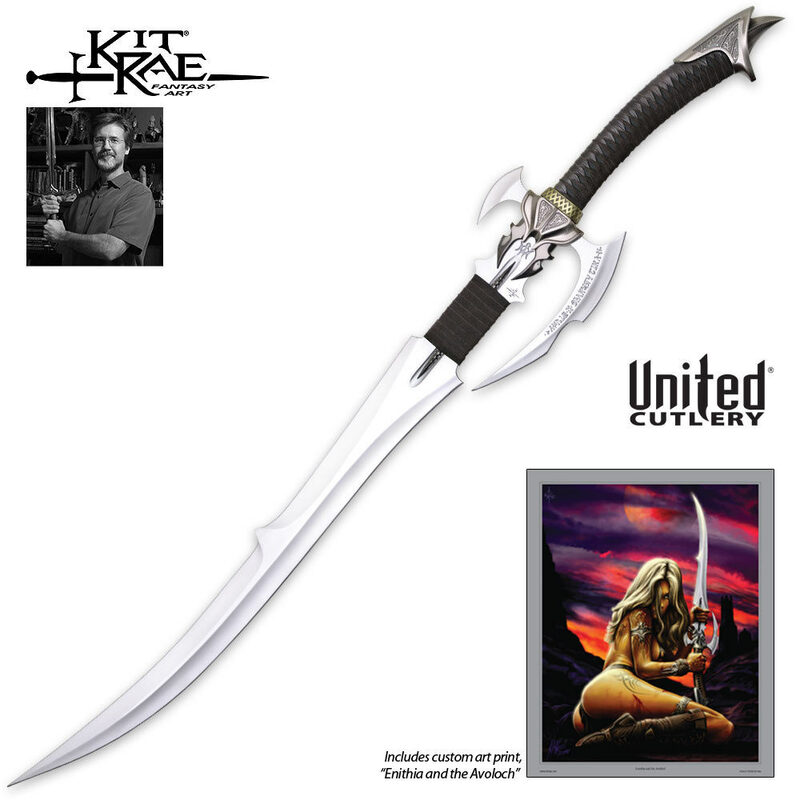 I love it and plan to eventually acquire all of the Kit Rae swords. it came wrapped in three boxes and I think that that is good for keeping it from getting scratched or dented. I bought it and it came three days later. Fastest shipping I have ever received. It is designed flawless and I seared for any downsides and I only found two. The absolute weight of it so amazingly heavy its practically impossible to actually be used unless you hold the part of the blade that is wrapped with leather. I took a test and the sheer weight of the sword punctured both sides of the box that the sword came in. And the second flaw is that the hilt is pointed and pokes your hand and will rip it up. Other than that it is a perfect sword in my mind and I would recommend this to any fantasy sword lover. I will definitely be buying from budk again. thanks budk. This sword is a must have! The craftsmenship put into creating such a beautiful and awesome weapon is second to none. When I first opened the box, I instantly knew that it would be one of my favorites. I say this to anyone who passes this weapon when shopping to get it, and if you don't have the money then, wait and save for it. I promise you it is a priceless collection to any weapon collector! GREAT quality sword. Every detail is precise and the grip is just amazing. Great addition to my collection and it stands out significantly. The weight feels great and overall, it is a very great sword, but one problem was that when I was holding it, the leather design on the handle broke. It wassn't a big deal though, all I had to do was glue it together again. Shipping was fast ; this was my first purchase from the designer of Kit Rae, and I am certainly going to continue to purchase more. This sword is definitly worth every penny. Hands down the best purchase I have made from Trueswords. This sword is amazing and bigger than I first imagined. The false edges are done very well and the sword stands out from the rest of my collection. Once again, true swords delivers! im gonna try this review a little differently, ill list the pros, cons and overall impressions with the product. beautiful finish on the blade itself, very shiny and no imperfections anywhere such as smudges or scratches. leather hilt wrap and blade grip is very tight and fits extremely well with the overall look of the sword. very comfortable to hold and wont move along the hilt. pummel fits in nicely and just adds to the beauty of the sword. shipping was prompt and the sword was well protected from anything that might happen during shipping. the sword even had a layer of choji oil on the blade to keep the blade in pristine condition.....you dont see that very often anymore. etching of the runes on the blade grip guard and other inscriptions is very well done. the center of gravity is just bellow the center of the blade grip, not perfect, but pretty close. the runes on the blade grip guard are only on one side, the other side is plain steel. thanks again, and i will be back for more!! !